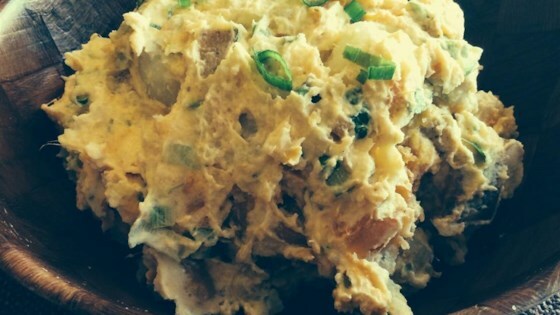 "Sweet and white potatoes combine in a low fat, tasty alternative to a picnic staple. Adjust the curry and cilantro to your taste, as both can be overpowering." Place potatoes in two separate saucepans and cover with water. Bring to a boil over high heat, then turn heat to medium-low. Cover, and cook until tender but still firm, 12 to 14 minutes for sweet potatoes, and 10 to 12 minutes for white potatoes. Drain and place in a large mixing bowl. Sprinkle with vinegar, and cool. To make the dressing, combine the mayonnaise, sour cream, lemon juice, and curry powder in a small bowl. Season to taste with salt and pepper. Mix the green onions, celery, and cilantro with the potatoes. Pour the dressing over the potato mixture, and toss to evenly coat vegetables. Refrigerate at least 1 hour before serving to let flavors blend. Did not change a thing when making this. We did not really enjoy the this. The flavors did not come together in a good way. Probably will not make again. I USED RED POTATO'S AND WHITE YUKON GOLD POTATOES, THIS WAS REALLY GOOD SERVED WITH bbq rIBS, UMMMM !!! I really like this recipe, the only thing I did differently was to add eggs.